I lived in Hong Kong for some years. One of the facts I observed was that Hong Kongers by and large do not like Indians and many of them even hate us. Whether an Indian goes on to look for a home or on the streets to buy groceries, the feeling is palpable. Many Indians I talked to said they feel it rather strongly. I had asked several people but got no satisfactory answer. I could only apologize to him and said it was an injustice. But what he had said left me perturbed. In social sciences ‘the other’ is a term that denotes how human beings divide, create walls with other groups whom they perceive as not similar to them and even inferior. For the American ‘the other’ is everyone who is outside America. For the British everyone who is not White and outside the country is ‘the other’. For the man from Pakistan it has become the Indian. Same can be said of the Chinese. But the curious thing for Indians is that for many an Indians ‘the other’ is not an outsider but another Indian only with whom his deepest chasm lies. He is someone whom we make into an enemy. “You Indians, you have done it with your own people, like in Jallianwala Bagh. That is how the British controlled your nation for two centuries, isn’t it?” The historian’s words have stayed with me since then. In one of his books, Amitav Ghosh, the author, writes that the British believed that the Indians can always be relied upon to ruthlessly put down any one whether their own in India or anywhere else on their orders, something they could never imagine doing with anyone else. Would a Japanese be ever trusted to fire on its own people on the orders of a foreign General? Would a Chinese army have done so when asked? I believe the answer is a big no. Is that why even today we are deeply divided, can torture a fellow Indian and feel little empathy, even shoot at him or beat him to death? Why did we Indians create ‘the other’ amongst each other and not outside like other nations do? 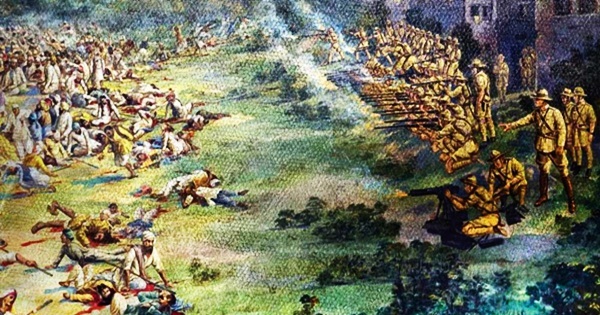 Once, a British historian, on the mention of Jallianwala Bagh, said that a British police force or army would never shoot at its own people if asked to do so. Why did we Indians did it then? I believe it is worth finding an answer to this dilemma. Why didn’t the police force refuse to follow Michael Dyer’s orders and not shoot at their own people? This maybe is one of the most poignant and perplexing questions in understanding why British could rule India. Has the notion of ‘the other’ as one we can hate and eliminate always existed amongst us in our history and as one that the British only perfected when they came in contact with us? I wish to ask this on the 100th anniversary of the tragedy of Jallianwala Bagh if we as a society created a gap within that can cause fissures and we can again be ordered into maniacal behavior on the orders of a white man or woman. Did we carry our philosophy of ‘vasudeva kutumbakam’ too far and become like the subjects in Milgram’s experiment? Jallianwala Bagh to me appears to be not the action of a deranged, crazy lunatic General but of a psychopath who knew this weakness of Indians only too well, who understood this mindset in us. He knew that when ordered to fire, the men wouldn’t stop because the cries of their own country men would have no effect on them. This philosophy, sick and dangerous, may need to be addressed and understood that may lead us to kill each other or destroy. Will it ever lead us to become a united cohesive nation and not hold us back? Creating ‘the other’ and making him into an enemy is dehumanizing which has just not only been symbolic, making us slaves but also making us lose what is the most precious, our freedom. It delineated us from the power that rightfully belonged to us as a nation. Last year we visited the Jallianwala Bagh. There were hundreds of people laughing, talking and taking pictures. No single face looked solemn. Only some seemed curious looking at the Well or the Bullet marks on the wall. Where does this detachment from our history comes from? Slavery dehumanized us Indians. As we know from history, no group cedes its privileges over others out of altruism but is forced to do so when the privileges they enjoy begin to threaten their survival. Gandhi could never do that to the British. Only once during the INA Trials and the Naval Revolt, it happened when the idea of one Indian being separate from ‘the other’ got erased terrifying the British into thinking it might bring their annihilation in India. Will the present generation erase this blot? In it perhaps lies the safety that will make our future generations safe from the contradictions that pushed our ancestors into slavery and annihilating each other. Jallianwala Bagh – World’s Most Heinous Terror Attack by the British Goa Inquisition: Portugese Massacre of Innocent Hindus and Destruction of Temples The Plunder of Our Temples and Heritage: Why Indians Don’t Care What is Caste? How Indians are Kept in Dark on Facts and Divided Today on Votes Ancient Indians Knew Science of Fertilization without a Microscope? Here Are the Wow Facts! Does the Fear of Naseerudin Shah Reveal a Deeper Message?